I have been working on a new play. Now maybe you assume, like many do, that I am just a critic or columnist. But to my credit, I have written seventeen plays (seven of them being one-act productions). Of these seventeen plays, twelve have been produced and performed for the stage around the country, some more than once. 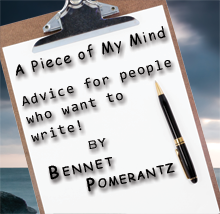 Though many may say (and have), "Bennet, you are just a critic or a radio show host!" understand that a writer is a writer. Being diverse in writing means never getting yourself pigeonholed into being thought of as a certain type of genre writer. For example, Stephen King is thought of mainly as a horror writer. Yet he is also a noted columnist for Entertainment Weekly, the author of a biography of horror, a screenwriter, a film director and a mystery author. So this month, since I am working on a new play…I offer a few basic start up rules and tips for writing for the stage. Bennet's Rule one: Know that writing for the theater is a different animal than for writing a movie screenplay. The idea of film is action in motion. In the world of the theater, the idea of a play script is action through words. You must convey more in dialog than action. Bennet's Rule two: The ideas come first. When I did a writer's workshop a few years ago, someone asked me, "Do I need to write in script or screenplay format?" I said, "Get the words down FIRST. Get the ideas down on paper. Then worry about play format and style." Bennet's Rule three: DON'T EVER be married to YOUR script. Remember, once it is finished and out of your hands, it is the DIRECTOR's script! It is not like a book. Your play is the blueprint for HIS vision. Your words will be edited by the director, then by an actor or actress will edit them when the play is performed. Once it is finished, let it go! Now you must understand, as a book or short story author, you are also a scenic designer, costume designer, etc. When you write a play, you need to give as much information and detail about your sets as to designing and describing your characters, costuming your characters, and the time of the play. This will help the set designer and the actors create. I remember a play I wrote called 'Doctors Heal Themselves'. I described the set of the play, the psychiatrist's office of Dr. James Franklin, to the nth item on the stage. I carefully explained everything in my script with painstaking details, from where the desk would be placed upon the stage to the painting which stood behind the Doctor's desk to the actor's wardrobe. The actor who first played Franklin on stage said he was so grateful for the details in my script, he said it helped him create his character. The gifted director made the set totally different from my script, changing the place of where the art was hung and thereby the focus of the action, without changing a line of my play script and any dialog. This confused the audience and the director blamed me. Bennet's Rule four: Get creative! Stories of War is my one act reader's theater, retells the ideals of war and its aftermath from four different viewpoints with a narrator to introduce each character. The people in the cast do verbal asides to highlight each other's performances, acting like they would in any other play. The first production of War I directed and produced myself. I was not giving a GIFTED director a chance to destroy my theater vision. However my little antiwar tract, after its debut, has appeared in a few one-act festivals around the country over the years. I always get surprised when a little royalty check from a new production of War comes in...and lately I have been getting a few. In the musical Miss Saigon, there was the illusion of a helicopter on stage. In the Sherlock Holmes play The Crucifer of Blood, Paul Giovanni created the London of 1880's and even a ship on the stage, write it and see what can be done. If you are doing community theater, try the best to see what you can do. That is up to you, the producer and the director. Well, I better get back to the old grindstone, and finish writing this new play...maybe next year on BROADWAY!..and maybe the Tony’s...I can dream can't I? Until next month, REACH FOR THE STARS! Columnist: Bennet Pomerantz has covered the Audio medium for the last 20 years. He has syndicated newspaper columns, AUDIOWORLD and "Movies of Your Mind", in Affaire De Coeur Magazine. In which he showcase his vast and diverse knowledge of the spoken word medium.